No Laughing Matter...How Improv Improves Business. Robin Williams will always be remembered as the improvisational genius that was forever present in the moment, and the only thing faster than his mouth was his mind. His speed and focus allowed him to feel the audience and change direction on the fly. Although Mr. Williams made improv look like riding a bike, very few people can upstage him or would even try. But was his skill innate or learned, and what can we, as business executives, study from his ability and apply to the business world? I sat down with Bob Kulhan, the CEO and Co-Founder of Business Improvisations (http://businessimprov.com/) to understand more about how innovative thinking and smart business skills can stem from improv insights. Trained by one of today's most famous comedians, Tina Fey, he recalled words of advice from his instructor: "Don't try to be funny or clever - just support the people around you and make them look good." Not an easy bit of advice to swallow, especially living in an individualistic society. It's not your own self-promotion that is of value. It's valuing your team members' input and helping to elevate them to the next level. In his book, Servant Leadership, Robert Greenleaf highlights how servant leaders are attentive to growth and development of all those around them as part of their team. And as part of the curriculum at Business Improvisations, building trust and team support is one of the top three improv lessons taught. Finding the value in others and trusting the individual's input is what knits individuals into a team that wants to be part of something bigger than themselves. This leads to the golden rule of improv being "Yes...and." This little gem helps to build momentum, innovation and relationships instead of shutting down ideas by reacting with "no...but." According to Mr. Kulhan, yes...and is the single greatest tool to suspend judgment, focus intently and not just be in the moment but embrace it. Similar to one of Robin William's explosive riffs, embracing the moment doesn't come from editing or planning. Yes...and helps to build momentum, action and trust within the team. It leads to intent listening, hanging onto every word being said and being committed to the challenge you've accepted. All crucial skills needed to succeed in business. 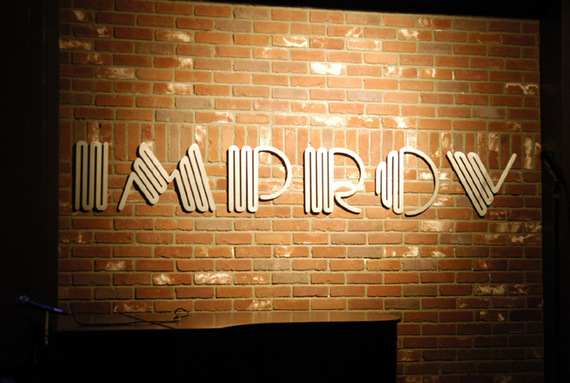 Improv is not all about flying by the seat of your pants. The instructors at Business Improvisations teach improv tenets that help to establish something vital for all presenters in the boardroom: to be comfortable in your own skin and let people into your world versus running the room. They also encourage failing and believe in the power of failure since the school of hard knocks is where all great improvisational geniuses became great. After recently taking a 2-hour improv course at the Manhattan Comedy School (http://www.manhattancomedyschool.com/), I can personally attest to the fact that failure is innate in improv. But it's also a team sport; there is no single star in the group since your improv group is supporting you and you them. The same applies in the presentation room. Rehearsing your subject matter is your opportunity to test delivery methods, flunk in front of friends, integrate as a cohesive team, master the material. Eventually it looks like it's all off the cuff and that you're all finishing each other's sentences. "Improv is an art form with no boundaries, just techniques to help build better relationships since the one thing that improv relies on to work effectively is people." As in marketing and most other industries, we are in the business of relationships, and what better way to win in the boardroom than to build better relationships? Lisa Colantuono is Co-President of AAR Partners, a prominent agency search consultancy since 1980.